Christ before Pilate. (1-5) Christ before Herod. (6-12) Barabbas preferred to Christ. (13-25) Christ speaks of the destruction of Jerusalem. (26-31) The crucifixion, The repentant malefactor. (32-43) The death of Christ. (44-49) The burial of Christ. (50-56)1-5 Pilate well understood the difference between armed forces and our Lord's followers. But instead of being softened by Pilate's declaration of his innocence, and considering whether they were not bringing the guilt of innocent blood upon themselves, the Jews were the more angry. The Lord brings his designs to a glorious end, even by means of those who follow the devices of their own hearts. Thus all parties joined, so as to prove the innocence of Jesus, who was the atoning sacrifice for our sins. 6-12 Herod had heard many things of Jesus in Galilee, and out of curiosity longed to see him. The poorest beggar that asked a miracle for the relief of his necessity, was never denied; but this proud prince, who asked for a miracle only to gratify his curiosity, is refused. He might have seen Christ and his wondrous works in Galilee, and would not, therefore it is justly said, Now he would see them, and shall not. Herod sent Christ again to Pilate: the friendships of wicked men are often formed by union in wickedness. They agree in little, except in enmity to God, and contempt of Christ. 13-25 The fear of man brings many into this snare, that they will do an unjust thing, against their consciences, rather than get into trouble. Pilate declares Jesus innocent, and has a mind to release him; yet, to please the people, he would punish him as an evil-doer. If no fault be found in him, why chastise him? Pilate yielded at length; he had not courage to go against so strong a stream. He delivered Jesus to their will, to be crucified. 26-31 We have here the blessed Jesus, the Lamb of God, led as a lamb to the slaughter, to the sacrifice. Though many reproached and reviled him, yet some pitied him. But the death of Christ was his victory and triumph over his enemies: it was our deliverance, the purchase of eternal life for us. Therefore weep not for him, but let us weep for our own sins, and the sins of our children, which caused his death; and weep for fear of the miseries we shall bring upon ourselves, if we slight his love, and reject his grace. If God delivered him up to such sufferings as these, because he was made a sacrifice for sin, what will he do with sinners themselves, who make themselves a dry tree, a corrupt and wicked generation, and good for nothing! The bitter sufferings of our Lord Jesus should make us stand in awe of the justice of God. The best saints, compared with Christ, are dry trees; if he suffer, why may not they expect to suffer? And what then shall the damnation of sinners be! Even the sufferings of Christ preach terror to obstinate transgressors. 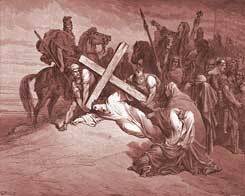 32-43 As soon as Christ was fastened to the cross, he prayed for those who crucified him. The great thing he died to purchase and procure for us, is the forgiveness of sin. This he prays for. Jesus was crucified between two thieves; in them were shown the different effects the cross of Christ would have upon the children of men in the preaching the gospel. One malefactor was hardened to the last. No troubles of themselves will change a wicked heart. The other was softened at the last: he was snatched as a brand out of the burning, and made a monument of Divine mercy. This gives no encouragement to any to put off repentance to their death-beds, or to hope that they shall then find mercy. It is certain that true repentance is never too late; but it is as certain that late repentance is seldom true. None can be sure they shall have time to repent at death, but every man may be sure he cannot have the advantages this penitent thief had. We shall see the case to be singular, if we observe the uncommon effects of God's grace upon this man. He reproved the other for railing on Christ. He owned that he deserved what was done to him. He believed Jesus to have suffered wrongfully. Observe his faith in this prayer. Christ was in the depth of disgrace, suffering as a deceiver, and not delivered by his Father. He made this profession before the wonders were displayed which put honour on Christ's sufferings, and startled the centurion. He believed in a life to come, and desired to be happy in that life; not like the other thief, to be only saved from the cross. Observe his humility in this prayer. All his request is, Lord, remember me; quite referring it to Jesus in what way to remember him. Thus he was humbled in true repentance, and he brought forth all the fruits for repentance his circumstances would admit. Christ upon the cross, is gracious like Christ upon the throne. Though he was in the greatest struggle and agony, yet he had pity for a poor penitent. By this act of grace we are to understand that Jesus Christ died to open the kingdom of heaven to all penitent, obedient believers. It is a single instance in Scripture; it should teach us to despair of none, and that none should despair of themselves; but lest it should be abused, it is contrasted with the awful state of the other thief, who died hardened in unbelief, though a crucified Saviour was so near him. Be sure that in general men die as they live. 44-49 We have here the death of Christ magnified by the wonders that attended it, and his death explained by the words with which he breathed out his soul. He was willing to offer himself. Let us seek to glorify God by true repentance and conversion; by protesting against those who crucify the Saviour; by a sober, righteous, and godly life; and by employing our talents in the service of Him who died for us and rose again. 50-56 Many, though they do not make any show in outward profession, yet, like Joseph of Arimathea, will be far more ready to do real service, when there is occasion, than others who make a greater noise. Christ was buried in haste, because the sabbath drew on. Weeping must not hinder sowing. Though they were in tears for the death of their Lord, yet they must prepare to keep holy the sabbath. When the sabbath draws on, there must be preparation. Our worldly affairs must be so ordered, that they may not hinder us from our sabbath work; and our holy affections so stirred up, that they may carry us on in it. In whatever business we engage, or however our hearts may be affected, let us never fail to get ready for, and to keep holy, the day of sacred rest, which is the Lord's day. If there was no shedding of the blood of Jesus, there will be no remission of our sins. And because Jesus died, justification is granted to all who live by faith in Him. Ever living, gracious and merciful interceding for us before our heavenly father. May we remain faithful unto the end, serving Christ in holiness and righteouness all the days of our lives through the help of the Holy Spirit. You all have good arguments..... But "time" is relevant on earth but not in eternity. Jesus is the resurrection and the life. He said he that believeth though he were dead yet shall he live, and he that liveth and believeth in me shall never die. He that hath the Son hath life and he that hath not the Son of God hath not life. We will see the great "I Am"
"And he said unto Jesus, Lord, remember me when thou comest into thy kingdom." This man had eyes to see beyond the present realities, and the facts done, to the eternal realms that preside over time. He understood that whatever men do in this life it could not hinder Christ from His eternal glory and purpose for coming into the world. As long as we have breath we can be of the truth and repent. "..And the voices of them and of the chief priests prevailed. And Pilate gave sentence that it should be as they required." Thus it has continued to this day, and so the wicked are embolden to fill the world with their wicked ways, and pursue their fantasies and perverted imaginations of a world without God and without His Anointed. Psalm 2 describes this that has been in the world since Cain. "And the same day Pilate and Herod were made friends together: for before they were at enmity between themselves." How does one become friends with someone so vile and unrepentant as Herod? And that, especially over the matter of the judgment of what to do about Jesus, and how is delivered up without cause by the who hate Him and want to ill Him without cause! "For if they do these things in a green tree, what shall be done in the dry?" When Jesus warned His enemies that their hatred and hostility that they were spreading among the people was blasphemy of the Spirit that would never be forgiven; or when they stirred up the crowds to violence and demanding Jesus' crucifixion; did any of them feel sorry or change their wicked minds in the centuries since? There is a verse missing. (FOR THAT WAS A HIGH DAY!) There were two Sabaths the week Our Lord Jesus died on the Cross. What Do You Think of Luke 23? Who asked Pilate for Jesus' body so he could lay him in a tomb?